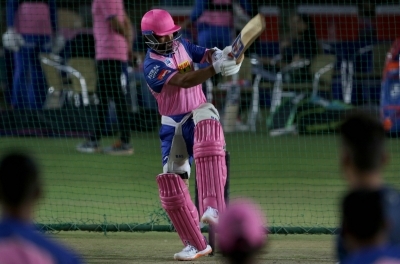 Mohali, April 16 (IANS) Rajasthan Royals skipper Ajinkya Rahane won the toss and opted to field against Kings XI Punjab in the Indian Premier League (IPL) match at the Punjab Cricket Association IS Bindra Stadium, here on Tuesday. The hosts made one change in the team with David Miller replacing Sam Curran. On the other hand, Rajasthan made three changes. Ashton Turner, making his IPL debut, replaced Liam Livingstone, and Stuart Binny and Ish Sodhi coming in for Steven Smith and Krishnappa Gowtham. While Punjab are placed at the fifth place in the league points-table, Rajasthan are at the seventh. Rajasthan Royals: Ajinkya Rahane (Captain), Jos Buttler, Sanju Samson (wicket-keeper), Rahul Tripathi, Ashton Turner, Stuart Binny, Jofra Archer, Shreyas Gopal, Jaydev Unadkat, Dhawal Kulkarni and Ish Sodhi. Kings XI Punjab: Lokesh Rahul, Chris Gayle, Mayank Agarwal, David Miller, Mandeep Singh, Nicholas Pooran (wicket-keeper), Ravichandran Ashwin (Captain), Murugan Ashwin, Mujeeb Ur Rahman, Mohammed Shami and Arshdeep Singh.